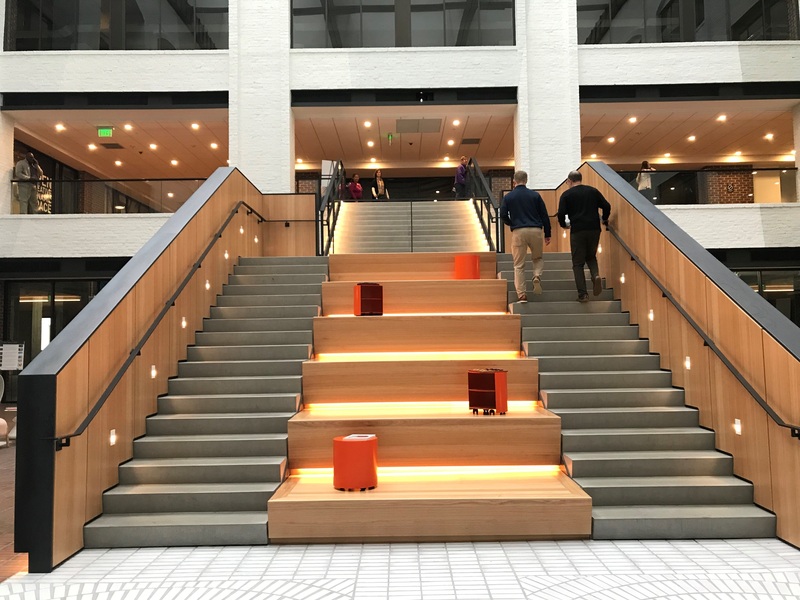 While visiting downtown Minneapolis recently, I literally stumbled upon the atrium inside the 130,000 square foot 801 Marquette office building. 801 Marquette is adjacent to the 17 story TCF Tower and the atrium is an amenity to tenants of both buildings. It is also open to the public. 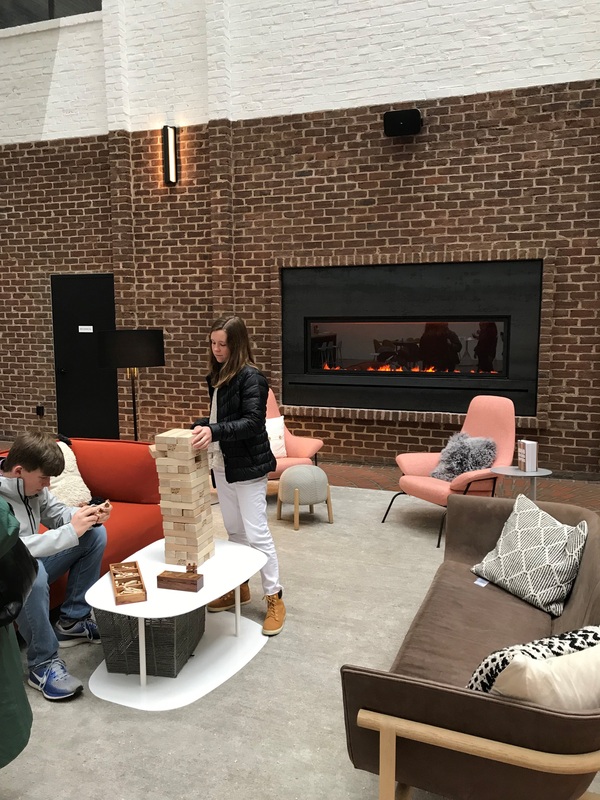 This multi-story community space features a fireplace, abundant living room and dining table seating, and a stunning stairway that doubles as amphitheater seating. 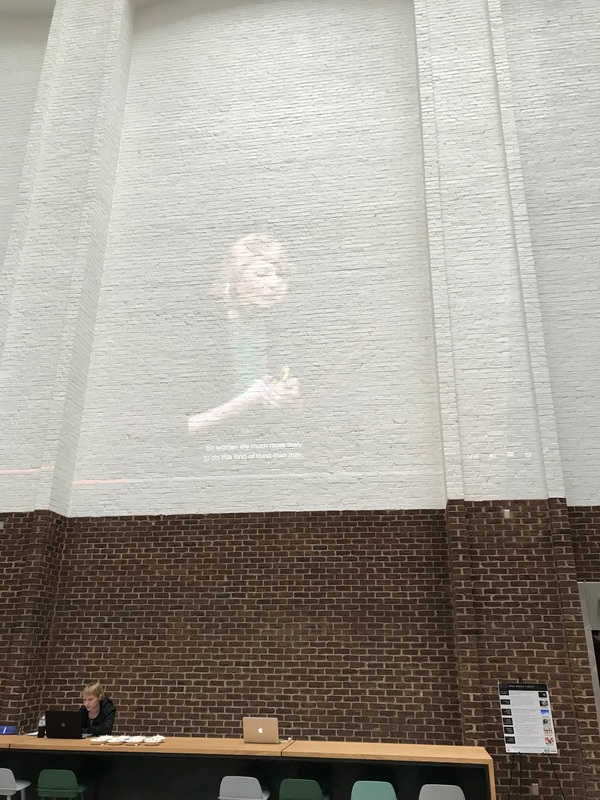 One four-story interior brick wall in the atrium has been painted white so that it can function as a projection screen. All of the tables in the atrium are stacked with assorted games like cribbage, backgammon, jenga, etc. so tenants can stop and enjoy a respite from their workdays. 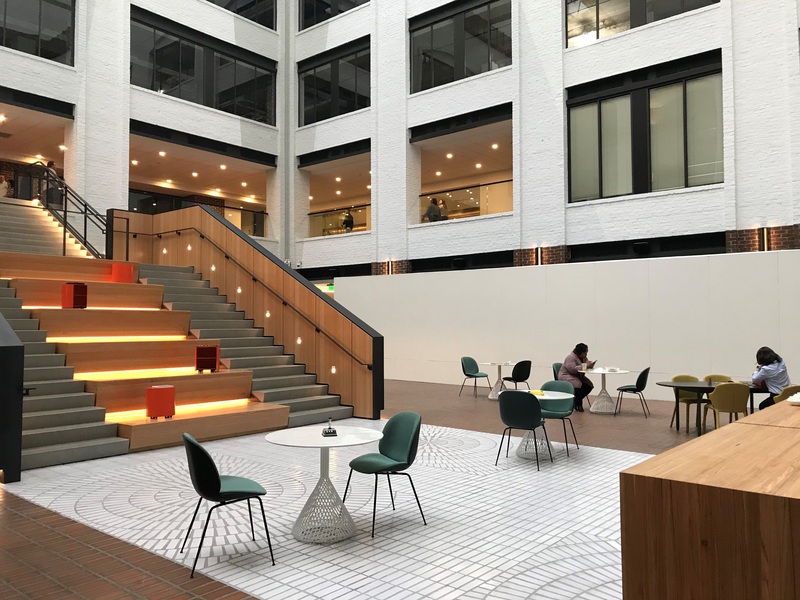 The space is staffed by a community manager who is responsible for planning and hosting community events including movie screenings as well as regular screenings of TED talks on the aforementioned white wall. There are also weekly Wednesday morning cereal bars and happy hours for the tenants. Musicant, the company that is responsible for operating the 801 Marquette lobby, also manages an outdoor lawn space at 333 South 7th Street in Minneapolis. In this space (“The Turf Club”), Musicant offers weekly concerts, outdoor fitness activities, monthly happy hours and tenant events. The outdoor fitness activities hosted by Musicant have included everything from a large yoga class to a massive spinning class with numerous spinning bikes brought in for the event. What a fantastic example of Place-Making: none of these amenities are expensive to offer.! What does this inspire you to do with your space?